A human chain for the independence of Catalonia from Spain, September 2013. Karl Burkhof/Demotix. All rights reserved.Will 2014 be the year of Catalonia as it might be that of Scotland, whose voters will decide by referendum on September 18 if they want to regain their independence after three centuries within the United Kingdom ? 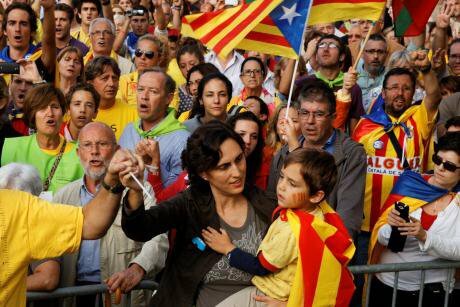 And, on November 9, the autonomous government has vowed to organise a referendum on Catalan residents' “Right to decide” whether they want to become a State and, if they do, whether they would choose independence or remain in the fold of the Spanish monarchy. A vote which is bitterly opposed – as unconstitutional – by the right wing PP's (Popular Party) government in Madrid as much as by PSOE (Socialist) opposition in the name of Spanish unity. For the moment, according to recent opinion polls, over two thirds of voters would vote “yes” at the first question and a small majority would opt for independence. In a democratic country there is nothing which could not be solved through negotiations. Provided there is a common will to negotiate, i.e., to give and take. The Catalan government, led by Artur Mas, head of Convergencia I Unio (CiU), the moderate nationalist party which spearheaded the fight for autonomy after Franco's death and who has long kept alive the hope of negotiating a better status with Madrid, is now advocating the “Right to decide”. He has announced for November 9 a referendum considered as illegal by the PP and PSOE, both of whom have vowed to oppose it by all legal means. Mas is also keeping up his sleeve the option of holding “plebiscitary” elections to the Barcelona Parliament, which would bring in a wider nationalist majority. This is precisely what the Catalan business community, as committed to their cultural values as to their economic interest in remaining part of a larger Spanish market, desperately want to avoid and are trying to act as a go-between between Madrid and Barcelona. They have, according to the daily El País (17 July 2014), pleaded with Mr. Rajoy to do away with his strategy of “immobility”, of sweeping the Catalan question under the carpet in the vain hope that it will eventually fade away, and to open negotiations on three fundamental issues which would rebuild confidence, cut the grass from under the pro-independents’ feet and make irrelevant the “Right to decide”: recognizing Catalonia as a nation, full control on linguistic and cultural issues, and fiscal autonomy. So far to no avail. As the head of Barcelona's Economists Circle, Antón Costas said, “the temptation of doing nothing is only leading us towards the extremes”. By targeting the Mas government, widely portrayed as extremist and irresponsible, and by refusing to negotiate on key constitutional, economic, social, cultural issues, Mr. Rajoy has – willingly or not – been playing into the hands of radicals like the ERC or social organisations like Omnium Català and ANC (Catalan National Assembly), who are behind the latest massive demonstrations. New local elections would probably bring to power a coalition led by ERC. Specially as a significant number of neo-Catalans – immigrants from the rest of Spain and abroad – have recently joined the traditional independence camp. While, at the same time, neither the PP nor the PSOE want to be seen by their traditional Spanish voters as giving away to “separatists”. Rajoy knows that his party's radical wing, influenced by his predecessor Jose Maria Aznar, could threaten his leadership. While PSOE leaders are well aware that no Socialist government could be returned to the Cortes without the Catalan votes. For their part, a spectacular scandal has just marred the image of Catalan nationalism when it was made public that the charismatic father of Catalan's autonomy and long-time head of the Barcelona government, Jordi Pujol, had squirrelled away millions of family money into foreign banks. This scandal, front-paged in all the media, is seen by many, in Spain as in Catalonia, as a nail in the coffin of the pro-independence crusade. Read Patrice de Beer's followup article, Catalonia revisited: farewell to great expectations, here.